I had been searching and trying to decide what knitted gift to make for my 1SSP. In July, I saw the newest catalog from WEBS and decided that the One Skein Wave Handwarmers in black were just the thing. Technically, this wasn’t a “quick knit” because I knit 3/4 of these in mid-July, and then put them aside for other projects and events. Last week, I finally finished them up and washed them. The Berkshire fluffed and softened up, and the handwarmers feel wonderful. I hope she will like them. (Eeew… the picture is blurry. And it was the best one I took. I didn’t realize it was this bad when I was editing it a couple days ago.) Berkshire does have quite the fuzzy halo, which definitely increases after a wash. These handwarmers have basic thumb holes, so I arranged them asymmetrically before blocking. I had extra Berkshire left over, so I decided to try the Felted Moebius Basket from Cat Bordhi’s A Second Treasury of Magical Knitting. The pictures in the book are so clear I was pretty sure I got the Moebius Cast-On correct, but I tried a second time to be sure. It was really fun to watch the Moebius form. The basket starts with a Moebius band as the handle/rim. The band is “split” in the middle so you can pick up stitches and knit the bowl section. It went quickly, I finished in about 5-6 hours knitting total time. Here’s a picture before felting. UPDATE: Here’s a bit of info re: Rina’s question. That’s a good question! To be honest, I didn’t check my gauge because I would be felting the basket. 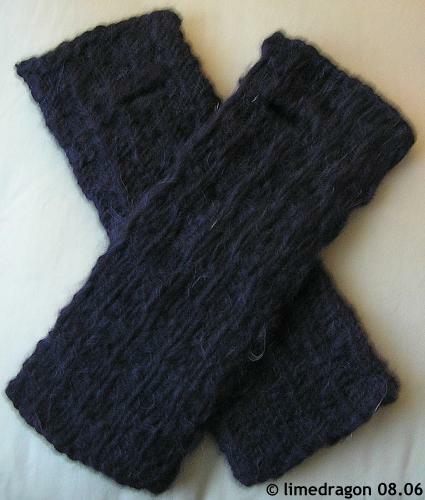 The yarn (Berkshire) is heavy worsted and I knit with only one strand and US 11 circular needles. < br />I checked the book, and Cat Bordhi discusses gauge a little bit under “Yarn & Design Suggestion” on page 15. 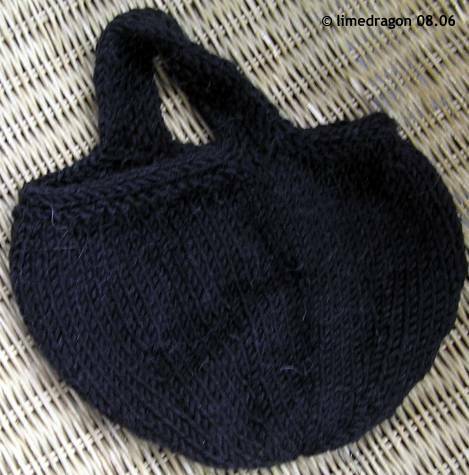 It looks like you swatch plainly (stockinette) in the round and measure that. I actually have A Second Treasury of Magical Knitting book and would like to try one of the cat bed for my Mom-in-law’s cat. It’s going to be her BD gift. How do you do the gauge for the mobius bag? Do you just knit in the round plainly withouth the mobius cast on? I can’t wait to see the bag felted up! The handwarmers look great — lucky secret pal of yours! I’m looking forward to seeing the bowl felted. I’ve got that book and it’s on my too-long to-do list.